I'm really shocked that people aren't 100% excited about this. It's a pretty big deal that WotC can now start supporting Vintage in a bigger way. Yeah, I saw that. I thought it was really cool that someone in RnD listened to your podcast. Awesome! shaman decreases goyf size, so i would think people would use this against goyf. most of the decks i think shaman could have a home in play goyf... so its hard to imagine morte than a few good pilots trying this for shits n giggles making top 8 with this as a 3/4 of. i think the elemental might start taking delver spots in decks for a while. not viable for storm tricks. Decks in Modern and in Legacy play Deathrite Shaman right next to Tarmogoyf. In Vintage where the artifact count is much higher, Shaman might not work as well. But since it can remove junk out of an opponent's GY, there should be plenty of targets. 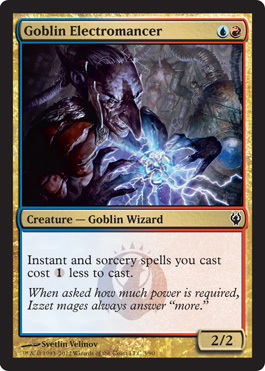 Besides, I'd be happy to sacrifice one point of damage to deny my opponent the ability to re-cast his Ancestral or Mysticial Tutor. I'm glad to see you are finally getting around to publishing this project, Steve. You are right that the history of Vintage matters. I hope tons of people read these as they come out. Investment implies risk. You bought cardboard, not US treasury bonds. You're in no way entitled to price stability. No cavern of souls only oing to alarm block. O banned cards so no jace tms. Drk conduct, mutavult, thought seize, and vendilon clique are my locks for making it. Unless I am mistakenn, they already confirmed Clique is being reprinted. The only card that has been confirmed is Tarmogoyf. It's been strongly hinted that City of Brass will be in the set too. But as for Clique, there's been no official word one way or the other. He's going to be good in Legacy and Modern. I dunno about Vintage. He'd have to offer more than Noble Hierarch. Does he? It's amusing that Null Rod and Abeyance are both from the same set and have, basically, the same wording. However, Null Rod still stops mana abilities, while Abeyance no longer does. I hate that too. Don't forget Cursed Totem is from the same block and it turns off mana abilities too. Excellent! I was just wishing there was another vintage podcast. We will be doing a part two set review, given the number of conversation worthy cards that have since been spoiled. I had a few drinks before our this podcast, and promise to be more sober this time. If you have feedback, let us know and we will try to respond before moving onto new cards. Also, make some room for beats, humans and/or other forms. Why is nobody getting a top 8 (or better, is there simply nobody who attempts) Is the archetype just to weak? Or is it too hard to play with? Another reason might be the time you need to invest to tune and test a relatively unexplored realm. No! Don't hurry up! There's still another 100 cards to be spoiled including the Golgari Charm, so take your time. Wait to see what else they come up with. Steve and I will definitely be talking about this card on the next segment of our RTR spoiler-cast. That's cool. Could you guys discuss whether or not all these utility charms in this set (and presumably in Gatecrash) will make Cunning Wish a useful enough spell to warrent play in Vintage? It seems packing 3-4 charms of differing sorts in your SB with 4 Cunning Wish mainboard would have some nice control synergy. I'm curious how people are listening to this: are you just using a web browser or smart phone? This podcast can also be downloaded on Itunes on a Ipod or on Apple TV (my personal fav). Listening to it on my Kindle Fire. Hope you guys do another one for the cards that have spoiled since this was recorded. I always enjoy your analysis. IF you're going to play Ancestral Knowledge, wouldn't you want to live the dream with some miracle cards? Too expensive or have in the casting cost. This is a pretty crazy card. Each extra copy makes the copy you cast worse as X will be 0 on the Experimented copies. Even if it is 0, it adds to your storm count, and why would you want to play four of them anyway? There's enough tutoring and filtering out there that one or two would be plenty. This looks fun! Maybe AK Intuition will be making a comeback! I meant for Standard, not Vintage. I meant for Modern, not Standard. Not Risky Bet. I meant Dangerous Wager. Yay! Can't wait to listen! Dubdub, are you being ignorant on purpose? Are you really going to take my argument aboit Tolarian Winds and apply it to Night's Whisper? Um, when your hand is empty. When you've just cast Yawg's Will. When you know your opponent has a red blast in hand. Oh, ok, in that case what about this comparison? Instant vs Sorcery. NW can't dump things in the yard for later. It costs life, which is precious nowadays. If combo decks used to play Recoup and Burning Wish, they can certainly play this. Discard your hand then draw two cards. Looks good to me in a long or mono red shell. What do you guys think? The parameters -- as I mentioned in the podcast - are far from easy. With Chain of Vapor, Nature's Claim, Wax/Wane, Simplify, Contagion, Mental Misstep, Firestorm, etc. etc Dredge has 0 or 1 mana answers for almost every conceivable piece of hate. That's true. So let's imagine a block someday where the theme is "Exile Zone Matters." And let's say that tons of the cards in the set have a Leyline of the Void or Bojuka Bog effect in addition to whatever else they do at about the same frequency as Snow occured in Coldsnap. Every non-basic land, hate bear, cantrip, and counterspell either Bogs or LotV's. I think at that point a Fish or Shop deck could pack enough hate and preasure to beat Dredge out of the format. That's why I think Kevin is on the right track that whatever piece of hate that could be conceivably printed, it would basically have to be hexproof. Although, even then, workarounds could be designed. As was mentioned in the podcast, there are effects which require sacrifices, not just destruction. That's why I said I don't think it's really possible. We already have plenty of Dredge hosers. I don't see the value or even the need for more. I agree. I don't see the need for anymore either. I don't see how GY hate could get any more efficient than Trap, Crypt, Bog, and Cage anyway. To answer your question of the week, I think they should have done Time Vault. What's sad is is the art they are giving away this year would have worked for it! Couldn't they have done other, non-power9 art like Mana Drain, Yawgmoth's Will, or Strip Mine? Repeating the same card is kinda lame. I top 4'd my local tourney today. If you didn't know, Chaos Warp is excellent when combined with Cage. You can't put a revealed creature into play from the library. They are both really good. I can't believe they put 2 Inkmoth Nexus in the red Pre-con. These event decks are no joke. They have great cards in them. The finals will be played out tonight, at 9pm EST, on Cockatrice as Onslaught and I finish the second TMD Invitational. As soon as the room is up, I'll post the room name here. Spectators are welcome.